- when it all goes horribly wrong! Oops!! Maybe this isn't the best way to promote the hobby of rc airplanes and radio control flying, but sadly things do go wrong now and again and so it's only fair to dedicate a page of this website to the fallen. Even though I have taken some flak, in the past, for putting this page up and publicising this aspect of the hobby, it's my true belief that newcomers to the hobby should be made aware of the risks. Why hide the fact that rc planes crash sometimes? 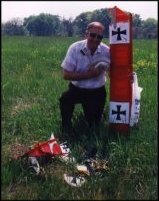 RC airplane crashes are all part of the hobby, and you need to write off a few planes now and again - it makes you a better rc pilot (so I've heard...). Mark Grubbs' plane saved by a very soft field! This ME109 aerial display sequence comes from Orban Pyrotechnics & Models of Hungary. This spectacular scene of destruction comes from Fremont Flyers of Fremont, New Hampshire. Above 3 photos from North Down Model Aircraft Club, Northern Ireland. Above 3 photos all from Bay City Flyers, Florida. Above left two from Valley Forge Signal Seekers, PA. Above right from EMRC, PA. Above 3 photos from EMRC, Pennsylvania. Above left from Plymouth Helis, Devon, UK. Above right two from EMRC. Above left two from Sky Rangers Model Flyers, Kamloops, Canada. Right, a wrecked PZ F-27B Stryker. Above: what you can do with the remains! Why do RC airplanes crash? There are several reasons why our beloved planes meet an untimely end. The number one cause is pilot error; either the pilot is flying beyond his or her abilities, or flying a plane that's too advanced or simply unsuitable for his/her level of experience. Or perhaps they make a genuine mistake because of, say, disorientation - even experienced rc pilots make the wrong stick movements sometimes. Equipment failure is another reason. In fact pilot error is commonly disguised as equipment failure! Unwanted radio interference is a known killer of rc airplanes, but with the advent of 2.4GHz radio control systems this is becoming less common. Having said that, though, 2.4GHz radio control systems aren't as infallible as initially thought and you only need to browse internet forums to see that there are pilots out there who have lost aircraft because of problems with such systems. Thankfully, though, it doesn't happen too often. Flying surface or control surface failure can also be the guilty culprit in bringing down our planes, especially if the builder did a less than satisfactory job on the hinges! Yep, there are several different reasons why rc airplanes crash. Prevention is better than cure, but sadly it takes a crash to figure out what went wrong and hopefully prevent it happening again in the future. This hobby is all about learning from our mistakes, and sometimes we have to do it the hard way. Some of the most spectacular rc airplane crashes happen in mid air, when one aircraft unintentionally (usually...) makes contact with another, particularly at high speed. This is almost always down to pilot error, and it's an easy mistake to make in crowded skies. You only need to fly once with one other plane in the sky to know how easy it is to misjudge, or not know, the position of the other plane. When a mid-air does occur, it's usually common etiquette for both pilots to share the blame (unless some obvious evidence suggests otherwise!). The sharing of blame makes sense, since both pilots were generally in the same situation - flying and being aware (or unaware...) of other aircraft in the sky. RC airplane crashes are all part of the hobby, there's absolutely no doubt about that. Any RC pilot who tells you that he/she hasn't crashed his/her airplane obviously hasn't been flying for long enough. Don't offer to take photos until the pilot mentions the idea. Hide the fact that you had your camera turned on before the plane even hit the ground. Saying the words "pilot error" is a definite no-no. Instead, just sympathetically nod your head in agreement with whatever the pilot blames. And if he blames himself (very rare), disagree with him completely and reassure him that the crash was caused by an outside influence completely beyond his control.